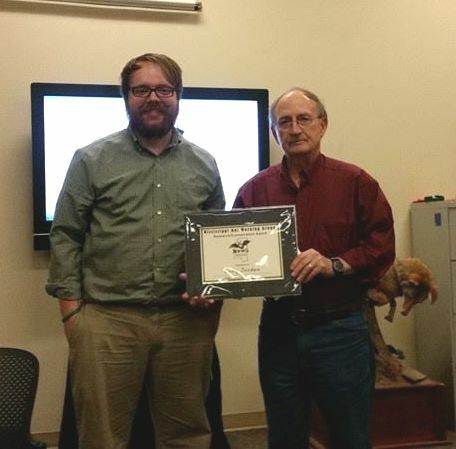 Biology graduate student, Cody Jordan, received the ‘Research/Conservation Award’ at the 2015 Mississippi Bat Working Group annual meeting. He was nominated for and received this award for work done as part of his thesis research with assistance from the MBWG. Cody’s Master of Science thesis research, supervised by Dr. Richard Buchholz, is focused on Rafinesque’s big-eared bats (Corynorhinus rafinesquii), an uncommon species. The colony at his study site is the only known colony of this species in Lafayette county. His research has yielded new information on population size and structure, roost characteristics, and foraging behavior. This information will be used for conservation and management decisions regarding the roost because it is located in a rapidly deteriorating building.